In 1983, I created a 6’ x 25’ glass mural at Black Lake Elementary near Olympia, Washington. This piece was designed to be touched by the students and there have been no problems. My fused glass resists vandalism as well as most materials including ceramics and wood. The janitor loves it because all that is needed is glass cleaner and a soft cloth to maintain it. I prefer interior walls for my murals. 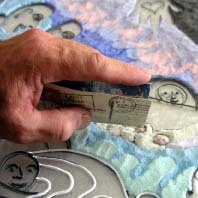 My fused glass tiles are adhered to aluminum which is screwed to the wall and this allows for removal and future relocation. 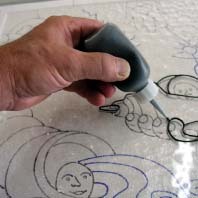 Money spent on my commissions is not lost when the building is remodeled or torn down, as is the case of grouted tiles.